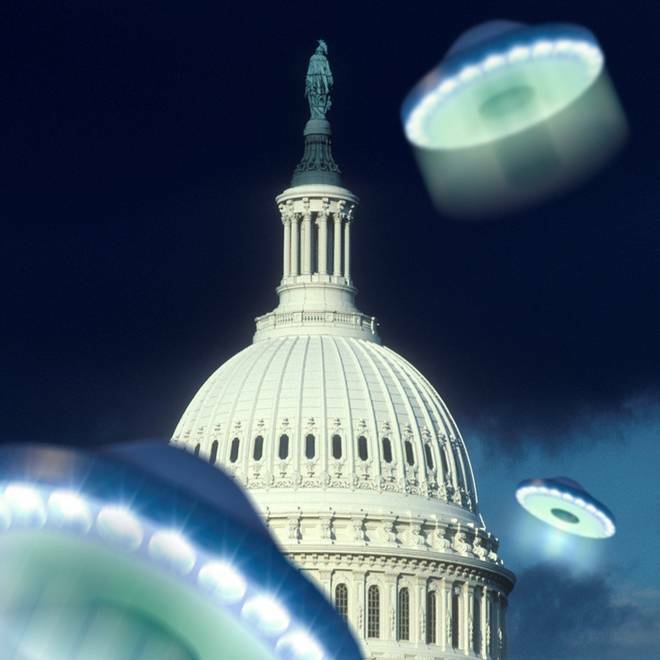 In a recently conducted poll, 19 percent of the respondents said they thought Washington, D.C., would be the most likely landing zone for a UFO. But if that ever happened, who's the best person to lead the welcoming party? About 65 percent said they'd rather have Barack Obama than Mitt Romney handle the situation. A new poll suggests that 77 percent of Americans think there's evidence that aliens have already visited Earth. The same poll suggests most Americans think President Barack Obama would do a better job than presumptive GOP challenger Mitt Romney if we had to fight off an alien invasion. And if we have to rely on a superhero to save us, they'd rather go with the Hulk than Batman. That somewhat silly survey was conducted to tout a "Chasing UFOs" TV series on the National Geographic Channel, but the results raise a serious question: If an alien civilization does get in touch with us, who's in charge of figuring out what to do? "Nobody's in charge," says Seth Shostak, who is senior astronomer at the California-based SETI Institute as well as the chairman of the International Academy of Astronautics' SETI Permanent Study Group. Shostak and I talked about SETI — the search for extraterrestrial intelligence — as well as its serious and silly implications tonight on "Virtually Speaking Science." The hourlong talk show is archived as a podcast on the Web and on iTunes. As the poll done for National Geographic suggests, a good number of people suspect the aliens have already arrived, presumably on UFOs or through interdimensional travel. Most scientists scoff at that idea. "Why would they appear only to cranks and weirdos?" British physicist Stephen Hawking asked earlier this month. But Shostak thinks it's only a matter of time before extraterrestrial civilizations actually do make themselves known, by sending signals across the light-years. Almost a decade ago, he predicted that we'd detect those signals by the year 2025, and today he told me he's sticking by that prediction. During our pre-show interview, Shostak laid out his rationale for the 2025 date and discussed how an alien-contact scenario is likely to go down. Check out this edited transcript of the Q&A. Cosmic Log: Do you still feel that 2025 is a good time frame for alien contact? And maybe more importantly, how do we know we're getting closer to the date? Shostak: People ask, 'Are you getting close?' And we no more know whether we're getting close than Chris Columbus knew he was getting close to the Americas — we might some palm fronds a day or two out, but other than that, we don't know. In some sense, it'll come as a complete surprise if we get a signal. We know that from false alarms. They never occur when you expect them, because you never expect them. But in terms of the prediction, that's based on the following: We're looking for needles in a haystack. If you ask, when are you going to find a needle, you need to know three things: How big is the haystack? How fast are you going through the hay? And how many needles are in there? We know two out of three. The haystack's the galaxy, and we know how fast we're going through it. We don't know the number of needles. So I took estimates of the number from the Drake Equation, and figured that it's two dozen years out. What's happened in the meantime is that the funding crisis has slowed things down a bit. Q: Do you think you need to revise the 2025 date? A: I think 2025, 2030 is about right, given that we can continue to do the experiment. Q: Is it a steady process, or is there an increasing rate of hay examination? A: This is all predicated on an increasing rate. That's the march of technology, which is mostly digital electronics. Computers keep getting faster and faster at any given price point, and that's good news for us. We can look at a larger chunk of the radio dial at once. We can go through the stars faster. Or we can look at bigger hunks of sky at once. It's mostly computing power that is responsible for the increasing speed of SETI. We're not sitting around with earphones the way Jodie Foster was. Q: Could it be that the patterns of communication by extraterrestrial civilizations take a form completely different from what we assume? A: We kind of know what areas SETI is weak in. It's been slow, in the sense that you've got a couple of hundred billion star systems in the galaxy, and if you can look at only a couple a day, that's really slow going. That might take forever. Can we look at more stars in a given time, with adequate sensitivity? The second thing is, it may be that you really have to look for a long time at any given star system. Of course, we don't do that. We look at any given star system, at any given frequency, for at most a few minutes. Some other search programs look for one and a half seconds at any given star system. If the aliens are broadcasting in our direction once a week, or once a day, or once an hour, we're not going to see it. We know that's a problem. Another issue is that the aliens may not know we're here because they haven't picked up 'I Love Lucy' yet. They don't know Homo sapiens is here, they just know that Earth is a planet with biology. They may not be motivated to target us relentlessly with reality television. They may broadcast now and then, with a little ping just to see if anybody's here. You really need an experiment that can pick up an intermittent, maybe one-off signal that's designed to ping the planet. Everybody knows that. That's a technology issue, but it's an issue that's getting better. "Daily Show" writer Kevin Bleyer joins "The Last Word" on MSNBC to talk politics and aliens. Q: Has anybody come up with a concept for an all-sky, all-the-time receiver? A: Yeah, well, all-sky, all the time, all frequencies — that's what you'd looove to have. On paper, you can design an instrument that can look at the entire sky. All frequencies, that's another problem, but you can certainly cover more frequencies than we do. It's all a question of whether you can afford to build such an instrument. The answer is, no, not now. It takes an enormous amount of computing power to do that. However, one thing you can say about the future is that there will be more computing power. This is not impossible. This is not like building rockets to go at 99 percent of the speed of light. That might work on paper, too, but in practice, that's a long way off. But this is something where you can say, with the computing power of a few decades hence, it becomes a practical thing. Q: Assuming that alien signals are detected by 2025, is humanity ready for that? A: Well, I don't know how much planning has been done. We've revised some protocols, but those are just the immediate steps you take if you pick up a signal. They deal with practical matters, like checking the signals out and alerting everybody. But I don't know that there's any large-scale effort to prepare humanity, any more than there was any preparation by the Indians in the Caribbean in case a Spanish ship showed up. I don't think that's a problem, to be honest. In poll after poll, the public has said they believe the aliens are out there. They see them on television every night, and at the movies every third weekend. A third of 'em think the aliens are already here, but they don't see a problem with that, either. Nobody's staying home. Everybody's still going to work. I think that psychologically, everybody could handle it. It's just going to be a big news item. Whatever it would be, people would find it interesting. But they'd be savvy enough to realize there's no immediate threat. The aliens would be 500 light-years away, and we pick up their signal. There's no reason to think that people would go just completely non-linear. The long-term consequences are less predictable. People would ask, should we broadcast back? Should we send a rocket in that direction? What should we do? Q: Who would be in charge if there was an alien signal? Assuming that scientists confirm that there's an anomalous signal pattern, hinting at extraterrestrial intelligence, what's the procedure? A: I don't think that there's anybody designated to be in charge. There was a flap a few years ago, involving an official at the U.N., but that was all a red herring. She quickly admitted that she's not in charge. Nobody's in charge. Look, the real people who will be in charge will be the media, because they'll be reporting it. In some sense, whoever finds the signal is probably in charge. If it's us, then somebody at the SETI Institute will be called. Or suppose it's the Berkeley group. Well, they're in charge. Or maybe it's a group that comes across the signal by accident. There's no hierarchy. Anyway, you know how the media work — they're not going to follow the rules. MSNBC's Ed Schultz, host of "The Ed Show" puts a political spin on a poll from National Geographic that suggests Americans prefer President Barack Obama over Mitt Romney on the alien-invasion issue. There's no danger in any of this, except for one thing: That's the idea that you're sitting around, and suddenly there's a signal, and you call a press conference. That's not the way it will happen. We get signals all the time, and someday one of those signals will pass all the tests, and it slowly emerges as a real signal. But it takes something on the order of five days before you're convinced. During all that time, the media knows about this, because there is no secrecy. But there's no press conference yet, because the scientists aren't yet sure themselves. This time lag means there will be all sorts of stories before the official word is out. It isn't because of leakage, it's because anytime anybody finds something interesting, they may mention it. They'll put it on their blog. Who knows what they'll do? It'll be very, very messy. And the corollary to this is that you can probably expect a lot of false alarms. There'll be something interesting, and a lot of people will write about it, and three days later it turns out to be nothing. Q: Some people worry that our own radio signals are advertising our presence in what could be a rough neighborhood, but I take it that's not a concern of yours. A: There are people who get their knickers in a knot about this deliberate broadcast stuff. National Geographic is supposed to be collecting tweets to broadcast as an answer to the "Wow Signal." I personally don't get heartburn about broadcasting. The fact is that NBC is broadcasting all the time, right? You can say, well, that's a weak signal. Sure it is. But if you're really worried about broadcasting into space, don't just shut down the publicity stunts. You better shut down the radars at the Seattle-Tacoma airport, too. They're broadcasting into space all the time. Tune in "Virtually Speaking Science" on BlogTalkRadio or in Second Life — and bring lots of questions. Seth Shostak and I were at the StellaNova Small Auditorium, courtesy of the Meta Institute for Computational Astrophysics, at 9 p.m. ET (6 p.m. PT/SLT) tonight. If you missed the live event, don't worry: It's archived by "Virtually Speaking" on BlogTalkRadio as well as iTunes. The "Aliens Among Us" survey polled a random nationwide sample of 1,114 Americans between May 21 and May 29. The poll was conducted by Kelton Research, which used email invitations and online surveys. Quotas were set to ensure reliable and accurate representation of the total U.S. population ages 18 and older. Margin of error is +/- 2.9 percent. More than one-third of those surveyed (36 percent) believe UFOs exist. Eleven percent are confident they've spotted a UFO, and 20 percent know someone who claims to have seen one. Nearly two-thirds (65 percent) said Obama would be better-suited than Romney to handle an alien invasion. Seventy-nine percent believe the government has kept information about UFOs a secret from the public. Nineteen percent think Washington, D.C., is the most likely landing zone for a UFO, while 28 percent think a UFO would touch down in Roswell, N.M.
Seventy-seven percent think there are signs that suggest aliens have visited Earth. Most of these people said that the evidence came in the form of photographs (60 percent) and videos (57 percent) of UFOs. If aliens landed, 22 percent said they would try to befriend the visitors. Fifteen percent said they would run away, 13 percent said they would lock their doors, and 2 percent said they would try to inflict bodily harm. Seventy-one percent think that aliens are more likely to exist than are superheroes, vampires and zombies. But if aliens attacked Earth, 21 percent said they would most likely call on the Hulk to deal with the havoc, compared with Batman (12 percent) or Spider-Man (8 percent). Fifty-five percent believe there really are officials like the "Men in Black" who claim to be agents and threaten those who come forward with UFO sightings. Seth Shostak has a talk show, too! Hear it at "Big Picture Science."